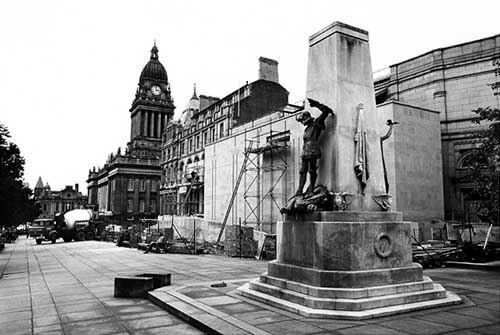 As Remembrance Day draws near, librarian Helen Skilbeck looks back at the history of the war memorial in Victoria Gardens, close to Leeds Central Library. Until the 1930s, there were buildings occupying the now paved area that now runs the whole length of the Library, City Art Gallery and Henry Moore Institute. These included the Leeds Permanent Building Society and Wharton’s Hotel, and all were demolished to allow for the widening of the Headrow. In December 1936, it was decided to create a Garden of Remembrance (also known as the Garden of Rest) in front of the Municipal Buildings (Central Library) and the gallery. The architect was J.E. Proctor, and the site was paved and provided with flower beds. 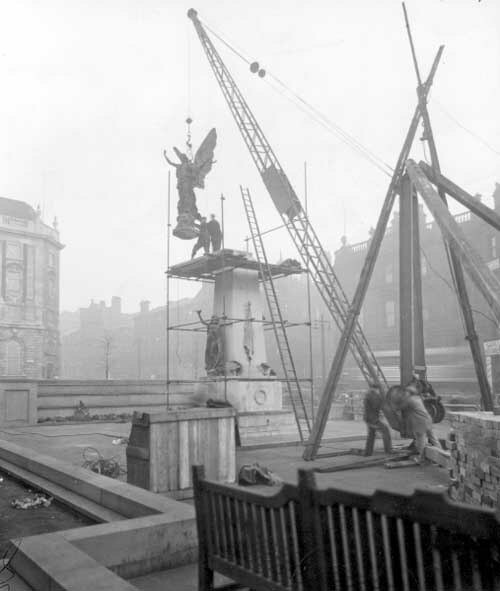 The scheme was to include the city’s existing war memorial, which originally stood in City Square. The monument had been designed by H.C. Fehr and was dedicated on 14 October 1922. 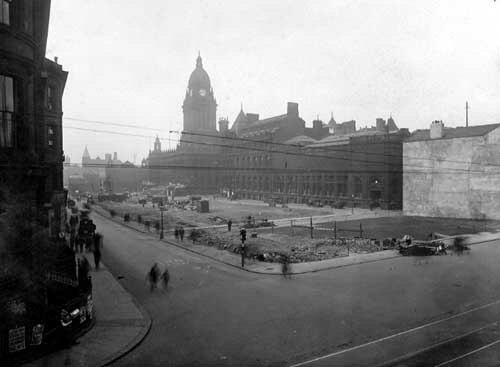 In 1936, changes to the traffic system in City Square meant that the memorial had to be removed, and it was decided in January 1937 to move it to the new Garden of Rest on the Headrow. It consisted of a bronze statue of a winged ‘Victory’ standing on a globe, holding a sword and a wreath, on a base of Portland stone. On opposite sides of the base were two other bronze figures representing War and Peace – to the right, St. George killing the dragon, on the left, ‘Invictus pax’, a hooded female holding a dove. There were four owls, the creature most synonymous with Leeds. The Garden of Rest was officially opened on 28 October 1937 by the Lord Mayor of Leeds, Mr. Tom Coombs; the opening ceremony was followed by a re-dedication of the war memorial. The memorial suffered in the early years in the Garden of Rest. In 1940, a crack was found at the base of the statue, and it was taken down for repairs. Because of fears of bomb damage during the war, it was not replaced until 1946. Wind damage caused the statue to be taken down again in 1965, and in 1967 the memorial was capped with marble. ‘Winged Victory’ was removed to Cottingley Crematorium, where it remained until November 1988. By this time it had deteriorated so badly that it could not be repaired; some parts had been stolen and it was taken down permanently. The head has survived, however, and become part of the Leeds Sculpture Collection held by Museums and Galleries. The memorial remained without a statue until 1990, when it was decided that a replacement should be found. This was not to be a copy of the old ‘Winged Victory’, but a statue of an Angel of Peace. The sculptor was Ian Judd, and the statue was dedicated at a Remembrance Day ceremony on 10 November 1991. Thankfully this statue has not suffered any damage in the way of her predecessor and remains standing tall over the gardens today. An excellent and timely blog. Thanks for the detail. Together with the reminder that what we walk past regularly without really thinking about it wasn’t always so. Thank you for this information it’s very interesting. I don’t know if you can help me at all. An Auntie remembers visiting a war memorial on The Headrow many years ago which she said had a stone with an inscription of our relative Benjamin Ford’s name on. She went on to tell me that this has since been removed, I can’t seem to find out where, do you have any information on where it could be please? Thank you for this enquiry – most intriguing! We’ll pass it to our Librarian team in the Local and Family History department (which includes Helen) and then get back to you as soon as we can.